CLEARANCE ITEM: ALL SALES FINAL. NO EXCHANGES OR REFUNDS. Top-grain leather upper, both inside and out. Reinforced leather patch on the inner heel to asborb wear. Lace cover to reduce drag on the trailing foot. Available in right-hand delivery only. The Podium Gold curling shoe is perennially a top choice of competitive curlers. The ¼” slider provides speed, the “hinged” slider accommodates various delivery styles, top grain leather inside and out offer durability and comfort, lateral support in the sole ensures stability and the lace cover eliminates drag. The ¼” Teflon slider gives you speed, lateral stability and no drift. The front slider is glued only part way back. From a comfort perspective this means you can walk in the shoe and it doesn’t want to keep coming off your heel. 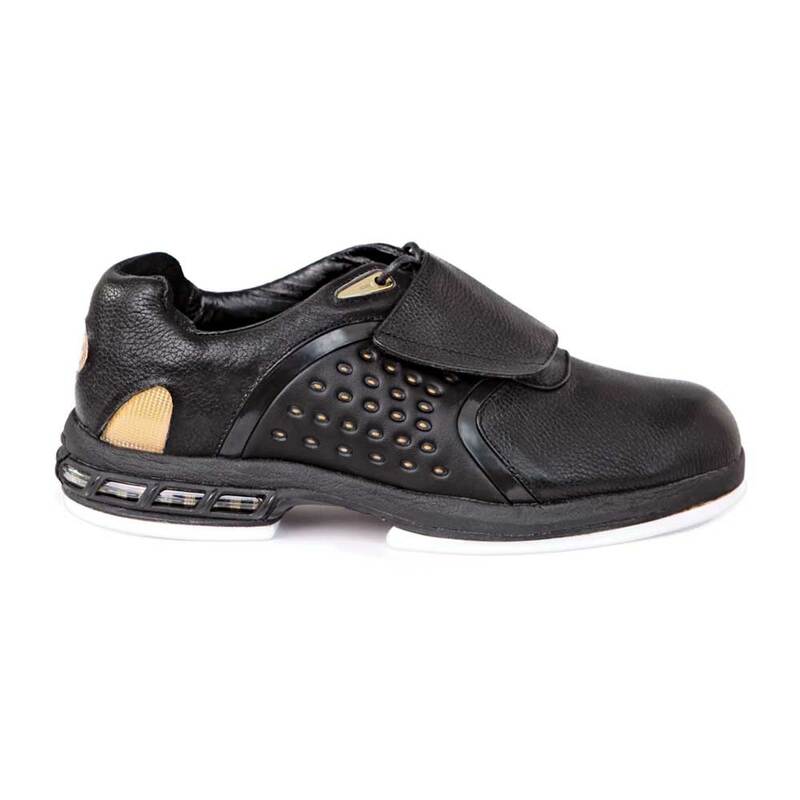 On ice, it means that whether you are flat foot or a definite toe slider, the shoe accommodates you comfortably. Top grain leather is used on both the outside of the shoe and also as an inner lining. You benefit from the durability, comfort and warmth of real leather. The outsole of the Podium Gold is made with lateral structural supports in the fore area. Without such support your weight would be focussed on the ball of your foot, however with such support your weight is distributed across the sole, providing you a wider balance platform and enhanced stability. Serious curlers often slide with their trailing foot flipped over such that the lace area is dragging on the ice. The Podium Gold incorporates a lace cover that slides readily on the ice, reducing drag. In 2015 Goldline reviewed the fit of the Podium Gold series shoes. As a result you can now expect the fit to be similar to your street shoe size. NOTE: THIS IS A CLEARANCE ITEM. ALL SALES ARE FINAL. NO EXCHANGES OR REFUNDS.